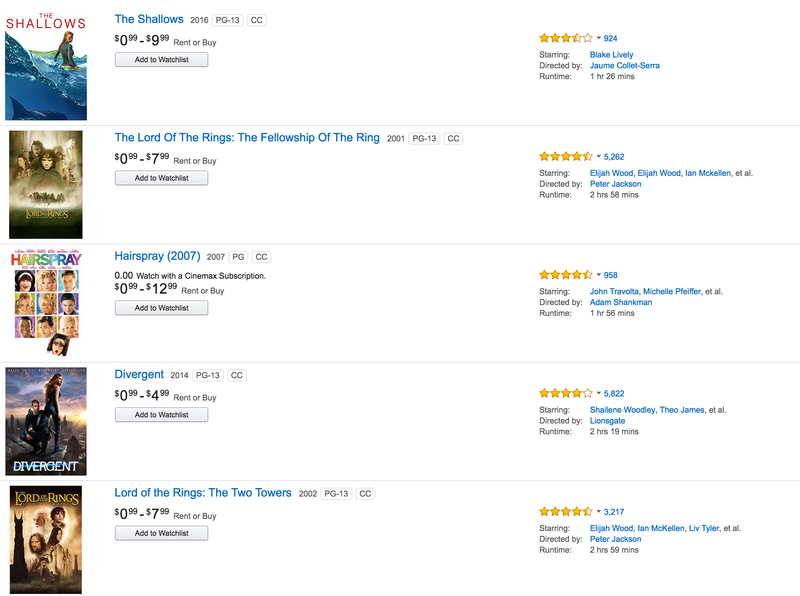 Following suit from last weekend’s $0.99 movie deal, Amazon is offering pages of more HD movie rentals for only $0.99 each. This selection of films are lower than Google Play and iTunes by at least $2 in most cases. Titles include The Shallows (above), The Hobbit: An Unexpected Journey, Blazing Saddles, The Great Gatsby, Gravity, Divergent, and more. We found a few more Digital HD Movies on sale starting at $2.99 to own at Amazon for a limited time. You can get the entire Harry Potter collection for only $5 each movie (Reg. $15). Here you can find all the compatible devices to play your newly acquired Amazon movies. Also, there’s still the 10 movies for $10 from iTunes right now. Shortly after the death of her mother, medical student Nancy Adams (Blake Lively) travels to a secluded beach in Mexico, the same beach her mother visited while she was pregnant with Nancy. Carlos (Oscar Jaenada), a friendly local resident, gives her a ride and drops her off at the beach. Nancy joins two other locals, and the three surf for several hours. Taking a break from surfing, Nancy video-chats with her sister Chloe (Sedona Legge). When she talks to her father (Brett Cullen) in an emotional and strained conversation, it is revealed that her mother’s death caused Nancy to consider dropping out of medical school.